This project was made in collaboration by using virtual reality technology and a custom ambisonic spatial audio system to immerse viewers in an uncanny 3D environment. 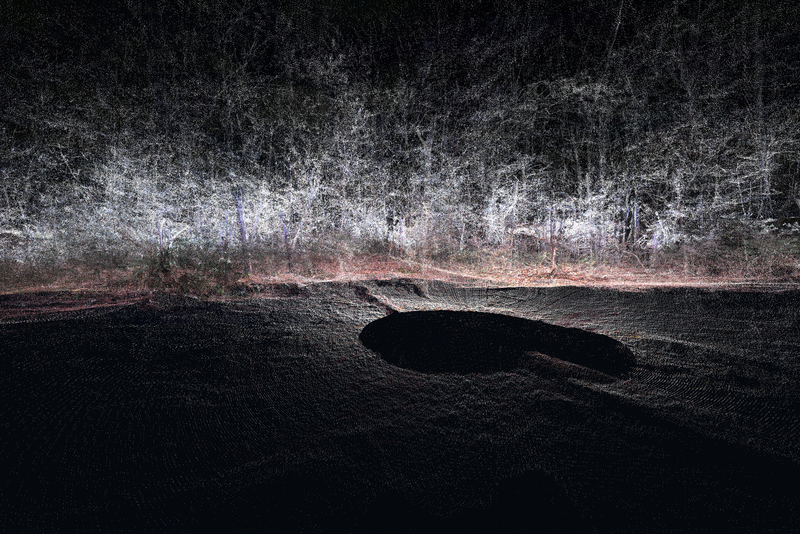 By using sophisticated LIDAR technology and 360° audio recording equipment, this group captured a site in New Jersey to create a virtual reality experience that sonically guides the viewer into a serene, enveloping space. However, the recording from the scanner by Manzione is purposefully incomplete and fractured. Cluett and Graham then re-fill the space left over from the imprecision of the scan with ambient swells and flourishes. Recombined in virtual reality, the original recorded visual data represents a fleeting memory, while the aural interpretations act as an attempt to regain what was lost. Where Paul Virilio would suggest that the virtual “window” or “teleport” would create a sensation of “no more delay” or “no more relief,” this piece instead offers a contemplative manifestation of how we try to hold on to lingering impressions.